For other uses, see Shrine (disambiguation). "Sacred site" redirects here. For natural places with sacred or spiritual significance, see Category:Sacred sites. The shrine of the Hodegetria at the Assumption Cathedral in Smolensk, Russia, photographed by Sergey Prokudin-Gorsky (1912). Shrine to Tin Hau at Repulse Bay, Southern District, Hong Kong. The Shrine, Oil on canvas, by John William Waterhouse (1895). A shrine (Latin: scrinium "case or chest for books or papers"; Old French: escrin "box or case") is a holy or sacred place, which is dedicated to a specific deity, ancestor, hero, martyr, saint, daemon, or similar figure of awe and respect, at which they are venerated or worshipped. 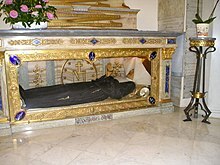 Shrines often contain idols, relics, or other such objects associated with the figure being venerated. A shrine at which votive offerings are made is called an altar. Shrines are found in many of the world's religions, including Christianity, Islam, Hinduism, Buddhism, Chinese folk religion, Shinto, and Asatru as well as in secular and non-religious settings such as a war memorial. Shrines can be found in various settings, such as churches, temples, cemeteries, museums, or in the home, although portable shrines are also found in some cultures. A shrine may become a focus of a cult image. Many shrines are located within buildings and in the temples designed specifically for worship, such as a church in Christianity, or a mandir in Hinduism. A shrine here is usually the centre of attention in the building, and is given a place of prominence. In such cases, adherents of the faith assemble within the building in order to venerate the deity at the shrine. In classical temple architecture, the shrine may be synonymous with the cella. Historically, in Hinduism, Buddhism and Roman Catholicism, and also in modern faiths, such as Neopaganism, a shrine can commonly be found within the home or shop. This shrine is usually a small structure or a setup of pictures and figurines dedicated to a deity that is part of the official religion, to ancestors or to a localised household deity. Small household shrines are very common among the Chinese and people from South and Southeast Asia, whether Hindu, Buddhist or Christian. Usually a small lamp and small offerings are kept daily by the shrine. Buddhist household shrines must be on a shelf above the head; Chinese shrines must stand directly on the floor. Small outdoor yard shrines are found at the bottom of many peoples' gardens, following various religions, including historically, Christianity. Many consist of a statue of Christ or a saint, on a pedestal or in an alcove, while others may be elaborate booths without ceilings, some include paintings, statuary, and architectural elements, such as walls, roofs, glass doors and ironwork fences, etc. In the United States, some Christians have small yard shrines; some of these resemble side altars, since they are composed of a statue placed in a niche or grotto; this type is colloquially referred to as a bathtub madonna. Religious images, usually in some sort of small shelter, placed by a road or pathway, sometimes in a settlement or at a crossroads. Shrine of Qubrat Hamran, South Arabia, dating from the 15th or 16th century. Shrines are found in many religions. As distinguished from a temple, a shrine usually houses a particular relic or cult image, which is the object of worship or veneration. A shrine may also be constructed to set apart a site which is thought to be particularly holy, as opposed to being placed for the convenience of worshippers. Shrines therefore attract the practice of pilgrimage. Shrines are found in many, though not all, forms of Christianity. Roman Catholicism, the largest denomination of Christianity, has many shrines, as do Orthodox Christianity and Anglicanism. In the Roman Catholic 1983 Code of Canon Law, canons 1230 and 1231 read: "The term shrine means a church or other sacred place which, with the approval of the local Ordinary, is by reason of special devotion frequented by the faithful as pilgrims. For a shrine to be described as national, the approval of the Episcopal Conference is necessary. For it to be described as international, the approval of the Holy See is required." Another use of the term "shrine" in colloquial Catholic terminology is a niche or alcove in most – especially larger – churches used by parishioners when praying privately in the church. They were also called Devotional Altars, since they could look like small Side Altars or bye-altars. Shrines were always centered on some image of Christ or a saint – for instance, a statue, painting, mural or mosaic, and may have had a reredos behind them (without a Tabernacle built in). However, Mass would not be celebrated at them; they were simply used to aid or give a visual focus for prayers. 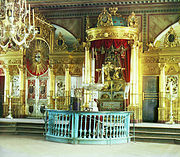 Side altars, where Mass could actually be celebrated, were used in a similar way to shrines by parishioners. Side altars were specifically dedicated to The Virgin Mary, Saint Joseph as well as other saints. A nativity set could also be viewed as a shrine, as the definition of a shrine is any holy or sacred place. Islam's holiest structure, the Kaaba (within the Al-Haram Mosque) in the city of Mecca, though an ancient temple (in the sense of a "house of God"), may be seen as a shrine due to it housing a venerated relic called the Hajar al-Aswad and also being the focus of the world's largest pilgrimage practice, the Hajj. A few yards away, the mosque also houses the Maqam Ibrahim ("Abraham's station") shrine containing a petrosomatoglyph (of feet) associated with the patriarch and his son Ishmael's building of the Kaaba in Islamic tradition. The Green Dome sepulcher of the Islamic prophet Muhammad (where his burial chamber also contains the tombs of his friend Abu Bakr and close companion Umar) in Medina, housed in the Masjid an-Nabawi ("The Mosque of the Prophet"), occurs as a greatly venerated place and important as a site of pilgrimage among Muslims. The Data Durbar Shrine, Lahore, Pakistan. Two of the oldest and notable Islamic shrines are the Dome of the Rock and the smaller Dome of the Chain built on the Temple Mount in Jerusalem. The former was built over the rock that marked the site of the Jewish Temple and according to Islamic tradition, was the point of departure of Muhammad's legendary ascent heavenwards (al-Mi'raj). More than any other shrines in the Muslim world, the tomb of Muhammad is considered a source of blessings for the visitor. Among sayings attributed to Muhammad include one stated as: "He who visits my grave will be entitled to my intercession." Visiting Muhammad's tomb after the pilgrimage is considered by the majority of Sunni legal scholars to be recommended. The early scholars of the salaf, Ahmad Ibn Hanbal (d. 241 AH), Ishaq Ibn Rahwayh (d. 238 SH), Abdullah ibn Mubarak (d. 189 AH) and Imam Shafi'i (d. 204 AH) all permitted the practice of ziyāra to the Prophet's tomb. The hadith scholar Qadi Ayyad (d. 554 AH) stated that visiting the Prophet was "a Sunna of the Muslims on which there was consensus, and a good and desirable deed." Ibn Hajar al-Asqalani (d. 852 AH) explicitly stated that travelling to visit the tomb of the Prophet was "one of the best of actions and the noblest of pious deeds with which one draws near to God, and its legitimacy is a matter of consensus." Similarly, Ibn Qudamah (d. 620 AH) considered ziyāra of the Prophet to be recommended and also seeking intercession directly from the Prophet at his grave. The tombs of other Muslim religious figures are also respected. The son of Ahmad ibn Hanbal, one of the primary jurists of Sunnism, reportedly stated that he would prefer to be buried near the mausoleum of a saintly person than his own father. While in some parts of the Muslim world the mausoleums of the tombs are seen as simply places of ziyāra of a religious figure's gravesite (Mazār/Maqbara), in others (such as the Indian subcontinent) they are treated as proper shrines (Dargah). Many modern Islamic reformers oppose the building (and sometimes the visitation of) tomb shrines, viewing it as a deviation from true Islam. This mainly includes followers of the Wahhabi and Salafi movements, which believe that shrines over graves encourage idolatry/polytheism (shirk) and that there is a risk of worshipping other than God (the dead). 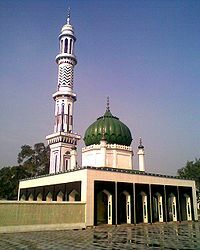 The founder of the Wahhabi movement, Muhammad ibn Abd al-Wahhab derived the prohibition to build mosques over graves from a hadith attributed to the Prophet Muhammad in which he said "May God curse the Jews and Christians who make the graves of their prophets into places of worship; do not imitate them." Additionally, he commanded leveling of the graves (taswiyat al-qubur), which the scholar Imam Al-Shafi'i supported. The Wahhabi movement was heavily influenced by the works of the medieval Hanbali theologian Ibn Taymiyyah who was considered by them to be the "ultimate authority on a great number of issues". One of these issues was the position on the visitation of the Prophet's tomb. According to Ibn Taymiyyah all the ahadith encouraging the visitation of the Prophet's tomb are fabricated (mawdu‘), are not contained in the six main collections of hadith or Musnad Ahmad ibn Hanbal, and violate tawhid al-uluhiya. This view of Ibn Taymiyyah was rejected by mainstream Sunni scholars both during his life and after his death. The Shafi'i hadith master Ibn Hajar al-Asqalani stated that "This is one of the ugliest positions that has been reported of Ibn Taymiyya". The Hanafi hadith scholar Ali al-Qari stated that, "Amongst the Hanbalis, Ibn Taymiyya has gone to an extreme by prohibiting travelling to visit the Prophet – may God bless him and grant him peace" Qastallani stated that "The Shaykh Taqi al-Din Ibn Taymiyya has abominable and odd statements on this issue to the effect that travelling to visit the Prophet is prohibited and is not a pious deed." Pilgrims outside the Shrine of Imam Husayn ibn Ali in Karbala, Iraq. Shias have several mazars dedicated to various religious figures important in their history, and several elaborate shrines (Marqad/Maqam) are dedicated to Shia religious figures, most notably in Iraq (such as in the cities of Karbala, Najaf, Samarra and likewise Kadhimiya) and in Iran (such as in the cities of Qom and Mashad). Specific examples of Shia shrines include the Al-Askari Shrine, and Imam Hussein Shrine. Other Shia shrines are located in the eponymous cities of Mazar-e Sharif ("The Noble Mausoleum") in Afghanistan, and Mashhad (al-Rida) ("Martyrium [of Ali Rida ]") in Iran. The Mausoleum of Ruhollah Khomeini in Tehran houses the tombs of Ruhollah Khomenei, the leader of Iran's 1978–79 revolution, his wife, and a few other related people. The Shrine of the Báb and its Terraces on Mount Carmel, Haifa. The Shrine of the Báb in Haifa, Israel. The Shrine of Bahá'u'lláh in Acre, Israel. Other sites have been designated as Bahá'í Shrines, the most notable being the home of William Sutherland Maxwell and May Maxwell in Montreal, Quebec, Canada. In Buddhism, a shrine refers to a place where veneration is focused on the Buddha or one of the bodhisattvas. Monks, nuns and laypeople all give offerings to these revered figures at these shrines and also meditate in front of them. Typically, Buddhist shrines contain a statue of either the Buddha, or (in the Mahayana and Vajrayana forms of Buddhism), one of the various bodhisattvas. They also commonly contain candles, along with offerings such as flowers, purified water, food, and incense. 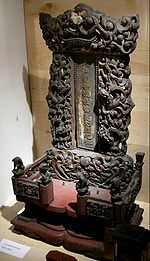 Many shrines also contain sacred relics, such as the alleged tooth of the Buddha held at a shrine in Sri Lanka. Site-specific shrines in Buddhism, particularly those that contain relics of deceased buddhas and revered monks, are often designed in the traditional form known as the stupa. Hörgrs, which may have originally exclusively referred to "holy places", whereas its Old English cognate hearg could mean "holy grove" and/or "temple, idol"
Vés (Old Norse) or wēohs (Old English), referring to either a types of shrines or sacred enclosures. The term appears in skaldic poetry and in place names in Scandinavia (with the exception of Iceland), often in connection with a Norse deity or a geographic feature. The name of the Norse god Vé, refers to the practice. In Hinduism, a shrine is a place where gods or goddesses are worshipped. Shrines are typically located inside a Hindu temple of various forms. 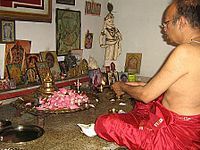 Most Hindu families have a household shrine as well. For example, according to memoirs of Stephen Huyler of his visits to some Hindu homes, a part of home was dedicated to the household shrine. Here, image of a deity was placed and offered prayers, instead of visits to a temple. Among Tamil Hindu homes, according to Pintchman, a shrine in Kitchen is more common. If the family is wealthy, it may locate the household shrine in a separate room. The line between a temple and a shrine in Taoism is not fully defined; shrines are usually smaller versions of larger Taoist temples or small places in a home where a yin-yang emblem is placed among peaceful settings to encourage meditation and study of Taoist texts and principles. Taoists place less emphasis on formalized attendance but include ritualized worship than other Asian religions; formal temples and structures of worship came about in Taoism mostly in order to prevent losing adherents to Buddhism. Frequent features of Taoist shrines include the same features as full temples, often including any or all of the following features: gardens, running water or fountains, small burning braziers or candles (with or without incense), and copies of Taoist texts such as the Tao Te Ching, Zhuangzi or other texts by Lao Tzu, Chuang Tzu or other Taoist sages. A number of Confucian temples and shrines exist across the sinophone world. Ofen in Chinese they are called 文庙 or "culture temples". Like Taoist temples they consist of gardens and then a large pavilion where incense is burnt. However inside the shrine a statue of Confucius or Mencius is held. Confucian shrines are often adorned with messages to the sage (God of learning) mainly wishing for good luck in exams. Confucian shrines exist outside of China too, for example in Naha, Okinawa. However some Buddhist temples reserve a room for Confucius also. The Alamo in San Antonio, Texas, U.S.
Fort McHenry in Baltimore, Maryland, U.S.
Touro Synagogue in Newport, Rhode Island, U.S. Halls of fame also serve as shrines into which single or multiple individuals are inducted on the basis of their influence upon regions, cultures or disciplines. Busts or full-body statues are often erected and placed alongside each other in commemoration. By extension the term shrine has come to mean any place dedicated completely to a particular person or subject such as the Shrine of the Sun in Colorado Springs, Colorado. ^ Harper, Douglas. "shrine". Online Etymology Dictionary. ^ Patricia Chang (February 23, 2007). "Shrines in shops in Chinatown". Downtown Express. 19 (41). ^ David Tyson (1997). "Shrine pilgrimage in Turkmenistan as a means to understand Islam among the Turkmen". Central Asia Monitor. 1. ^ "Masjid al-Haram - Oxford Islamic Studies Online". www.oxfordislamicstudies.com. Retrieved 2018-08-12. The Grand Mosque of Mecca in western Saudi Arabia. Along with the Prophet Muhammad 's Mosque in Medina, it is one of the two holiest shrines in Islam, its spiritual center, and the focus of the hajj pilgrimage. A place of worship even before the time of Muhammad, the mosque is organized around the Kaaba, a pre-Islamic “House of God” founded by Abraham and Ishmael, toward which all Muslim prayer is directed. The present layout of the Grand Mosque evolved from a series of enlargements during the Umayyad and Abbasid periods, Ottoman refinements, and recent Saudi additions. ^ "Kaʿbah | shrine, Mecca, Saudi Arabia". Encyclopedia Britannica. Retrieved 2018-08-13. ^ "Great Mosque of Mecca | Overview, Description, & Facts". Encyclopedia Britannica. Retrieved 2018-08-13. ^ Peters, F.E. (1994). "Another Stone: The Maqam Ibrahim". The Hajj. Princeton, New Jersey: Princeton University Press. pp. 16–17. ^ "Maqam-e-Ibrahim shines ... like visitors' faith". 25 September 2016. ^ "Al-Masjid An-Nabawy". www.olemiss.edu. Retrieved 2018-08-12. ^ "Important Sites: The Prophet's Mosque". Inside Islam. 2012-02-16. Retrieved 2018-08-13. The most distinct aspect of the mosque is a green dome called the Dome of the Prophet and marks the location of the Prophet Muhammad’s tomb. Abu Bakr and Umar, the first and second caliphs, are buried near the Prophet. ^ "Prophet's Mosque | mosque, Medina, Saudi Arabia". Encyclopedia Britannica. Retrieved 2018-08-13. ^ Slavik, Diane (2001). Cities through Time: Daily Life in Ancient and Modern Jerusalem. Geneva, Illinois: Runestone Press. p. 60. ISBN 978-0-8225-3218-7. ^ M. Anwarul Islam and Zaid F. Al-hamad (2007). "The Dome of the Rock: Origin of its octagonal plan". Palestine Exploration Quarterly. 139 (2): 109–128. doi:10.1179/003103207x194145. ^ Nasser Rabbat (1989). "The meaning of the Umayyad Dome of the Rock". Muqarnas. 6: 12–21. doi:10.2307/1602276. JSTOR 1602276. ^ a b Diem, Werner; Schöller, Marco (2004-01-01). The Living and the Dead in Islam: Indices. Otto Harrassowitz Verlag. p. 46. ISBN 9783447050838. ^ Bayhaqi. Sunan. V. p. 245. ^ Iyyad, Qadi. Shifa. II. p. 71. ^ Diem, Werner; Schöller, Marco (2004-01-01). The Living and the Dead in Islam: Indices. Otto Harrassowitz Verlag. p. 55. ISBN 9783447050838. ^ Diem, Werner; Schöller, Marco (2004-01-01). The Living and the Dead in Islam: Indices. Otto Harrassowitz Verlag. p. 23. ISBN 9783447050838. ^ Rapoport, Yossef; Ahmed, Shahab (2010-01-01). Ibn Taymiyya and His Times. Oxford University Press. p. 290/291. ISBN 9780195478341. ^ Rapoport, Yossef; Ahmed, Shahab (2010-01-01). Ibn Taymiyya and His Times. Oxford University Press. p. 291. ISBN 9780195478341. ^ Zargar, Cameron (2014). The Hanbali and Wahhabi Schools of Thought As Observed Through the Case of Ziyārah. The Ohio State University. pp. 28–29. ^ Ibn Qudāmah, Abū Muḥammad, Al-Mughnī, (Beirut: Bayt al-Afkār al-Dawliyyah, 2004), p 795. ^ Diem, Werner; Schöller, Marco (2004-01-01). The Living and the Dead in Islam: Indices. Otto Harrassowitz Verlag. pp. 7–8. ISBN 9783447050838. ^ Dasgupta, Piyali (7 January 2014). "799th birthday celebrations of Hazrat Nimazuddin Auliya, held recently at the Hazrat Nizamuddin Dargah in Delhi". The Times of India. Retrieved 13 June 2018. ^ "797th Urs of Khawaja Moinuddin Chisty begins in Ajmer". Sify. Retrieved 18 February 2012. ^ "Pakistan's Sufis defiant after Islamic State attack on shrine kills 83". Reuters. 17 February 2017. Retrieved 17 February 2017. ^ "Shrine - Oxford Islamic Studies Online". www.oxfordislamicstudies.com. Retrieved 2018-08-10. Many modern Islamic reformers criticize visits to shrines as mere superstition and a deviation from true Islam. ^ "Mecca for the rich: Islam's holiest site 'turning into Vegas'". The Independent. Archived from the original on 24 October 2018. Retrieved 2018-08-10. In the eyes of Wahabis, historical sites and shrines encourage "shirk" – the sin of idolatry or polytheism – and should be destroyed. When the al-Saud tribes swept through Mecca in the 1920s, the first thing they did was lay waste to cemeteries holding many of Islam's important figures. They have been destroying the country's heritage ever since. Of the three sites the Saudis have allowed the UN to designate World Heritage Sites, none are related to Islam. ^ "Saudi Arabia Bulldozes Over Its Heritage". Time. Archived from the original on 10 August 2018. Retrieved 2018-08-10. Wahhabism, the prevailing Saudi strain of Islam, frowns on visits to shrines, tombs or religio-historical sites, on grounds that they might lead to Islam’s gravest sin: worshipping anyone other than God. ^ "Medina: Saudis take a bulldozer to Islam's history". The Independent. Archived from the original on 10 August 2018. Retrieved 2018-08-10. In most of the Muslim world, shrines have been built. Visits to graves are also commonplace. But Wahabism views such practices with disdain. The religious police go to enormous lengths to discourage people from praying at or visiting places closely connected to the time of the Prophet while powerful clerics work behind the scenes to promote the destruction of historic sites. ^ a b Ondrej, Beranek; Tupek, Pavel (July 2009). Naghmeh, Sohrabi (ed.). From Visiting Graves to Their Destruction: The Question of Ziyara through the Eyes of Salafis (PDF). Crown Paper (Crown Center for Middle East Studies/Brandeis University). Brandeis University. Crown Center for Middle East Studies. p. 16. Archived (PDF) from the original on 10 August 2018. Ibn Taymiyya argues that the prohibition against treating graves as places of prayer is not based only on the impurity of such places;58 the true reason lies in concern over the temptation of worshiping the dead (khawf al-fitna bi alqabr). This was the opinion of Imam al-Shafi‘i and other salaf, who commanded leveling these graves (taswiyat al-qubur) and effacing what might arouse the temptation (ta‘fiyat ma yatafattan bihi minha). ^ Ondrej, Beranek; Tupek, Pavel (July 2009). Naghmeh, Sohrabi (ed.). From Visiting Graves to Their Destruction: The Question of Ziyara through the Eyes of Salafis (PDF). Crown Paper (Crown Center for Middle East Studies/Brandeis University). Brandeis University. Crown Center for Middle East Studies. p. 19. Archived (PDF) from the original on 10 August 2018. Relying mainly on hadiths and the Qur’an, Ibn ‘Abd al-Wahhab’s most famous work, The Book of God’s Unicity (Kitab al-tawhid), describes a variety of shirk practices, such as occultism, the cult of the righteous (salih), intercession, oaths calling on other than God himself, sacrifices or invocational prayers to other than God, and asking other than Him for help. Important things about graves are remarked on in a chapter entitled “About the Condemnation of One Who Worships Allah at the Grave of a Righteous Man, and What if He Worships [the Dead] Himself.”72 Ibn ‘Abd al-Wahhab starts by quoting a hadith: “Umm Salama told the messenger of Allah about a church she had seen in Abyssinia in which there were pictures. The Prophet said: ‘Those people, when a righteous member of their community or a pious slave dies, they build a mosque over his grave and paint images thereon; they are for God wicked people.’ They combine two kinds of fitna: the fitna of graves and the fitna of images.” He then continues with another hadith: “When the messenger of Allah was close to death, he . . . said: ‘May Allah curse the Jews and Christians who make the graves of their prophets into places of worship; do not imitate them.’” From this hadith Ibn ‘Abd al-Wahhab derives the prohibition of building places of worship over graves, because that would mean glorification of their inhabitants, which would amount to an act of worship to other than Allah. ^ Zargar, Cameron (2014). The Hanbali and Wahhabi Schools of Thought As Observed Through the Case of Ziyārah. The Ohio State University. p. 3. ^ Ondrej, Beranek; Tupek, Pavel (July 2009). Naghmeh, Sohrabi (ed.). From Visiting Graves to Their Destruction: The Question of Ziyara through the Eyes of Salafis (PDF). Crown Paper (Crown Center for Middle East Studies/Brandeis University). Brandeis University. Crown Center for Middle East Studies. p. 15. Archived (PDF) from the original on 10 August 2018. Ibn Taymiyya criticizes hadiths encouraging visitation of the Prophet’s grave, pronouncing them all forgeries (mawdu‘) and lies (kidhb). According to him, most famous are ”He who performs the pilgrimage and does not visit me, has shunned me” and “Who visited my grave must ask me for intercession.” Ibn Taymiyya notes that although some of these hadiths are part of Daraqutni’s collection, they are not included in the main hadith collections of Bukhari, Muslim, Abu Dawud, and Nasa’i, nor are they part of the Musnad of Ibn Hanbal. He observes that with regard to visiting the Prophet’s grave, ulama rely only upon hadiths according to which the Prophet must be greeted (al-salam wa al-salat alayhi).56 As for the contents of hadiths encouraging visitation, they contradict the principle of tawhid al-uluhiya. ^ Rapoport, Yossef; Ahmed, Shahab (2010-01-01). Ibn Taymiyya and His Times. Oxford University Press. p. 290. ISBN 978-0-19-547834-1. ^ Rapoport, Yossef; Ahmed, Shahab (2010-01-01). Ibn Taymiyya and His Times. Oxford University Press. p. 292. ISBN 978-0-19-547834-1. ^ Rapoport, Yossef; Ahmed, Shahab (2010-01-01). Ibn Taymiyya and His Times. Oxford University Press. p. 293. ISBN 978-0-19-547834-1. ^ "Free at last from Isis, millions of Muslims stage the greatest religious march in the world". The Independent. Retrieved 2018-08-12. The Arbaeen has provided many modern-day Shia martyrs, murdered by Saddam Hussein, al-Qaeda and Isis, but its purpose is to mourn the martyrdom of Imam Hussein, the revered Shia leader, killed in the battle for Kerbala in AD680. The long ritual walk to his golden-domed shrine in that city – some walkers spend 10 or 12 days on the road from Basra or Kirkuk, others two or three days from Najaf – comes on the 40th day of the mourning period as religious fervour reaches its peak among the faithful. ^ "Najaf - Oxford Islamic Studies Online". www.oxfordislamicstudies.com. Retrieved 2018-08-12. One of Iraq's two holiest cities (Karbala is the other one). Reputedly founded by the Abbasid caliph Harun al-Rashid in 791. A Shii religious center located south of Baghdad and six miles west of Kufa. Site of Ali ibn Abi Talib's (the first Shii imam) tomb. Kufa retained its importance as the locus of Shii activities until the fifteenth century, when Najaf replaced it. Hospices, schools, libraries, and Sufi convents were built around the shrine. Late nineteenth-century Qom replaced Najaf as the center of Shii learning; this was reversed with the rise of Ayatollah Khomeini (d. 1989) and Muhammad Baqir al-Sadr (d. 1980). ^ Abid, S. K. "Imam Ali Shrine, institution and cultural monument: the implications of cultural significance and its impact on local conservation management". CiteSeerX 10.1.1.735.1355. ^ Carnelos, Marco (18 July 2018). "Like it or not, Iran will continue to be the most powerful player in Iraq". Middle East Eye. Retrieved 2018-08-12. Every year, during the annual Shia pilgrimages to the Holy Shrines in Najaf, Karbala and Samarra, millions of Iranians, in numbers two or three times higher than the entire traditional Hajj pilgrimage to Mecca, cross the Iraqi border; they are spontaneously fed and housed by the poorest Iraqi Shia families free of any charge. ^ "Qom - Oxford Islamic Studies Online". www.oxfordislamicstudies.com. Retrieved 2018-08-12. Leading center of Shii theological seminaries and site of Hazrat-i Masumah, which is the second most important Shii shrine in Iran. Burial site of numerous shahs of the Safavid and Qajar dynasties and many religious scholars. Major center of political activity in 1963 , 1975 , and 1977 – 79 . The shrine and the Borujerdi mosque are important places for leading communal prayers and sermons. The shrine has been an economic and state institution, the focus of endowments and commercial rents dedicated to its upkeep, and a symbolic site whose opening and closing each day are accompanied by state-appointed guards extolling the sovereignty of the reigning government under God. Qom's madrasas in particular were a major center of resistance to the Pahlavi monarchy. When Ayatollah Khomeini returned to Iran from exile, he went immediately to Qom, which remains a key seat of the ulama's educational and political organizations. ^ "Imam Reza shrine complex (Mashhad, Iran): Mosque: Detail of tile - Yale University Library". findit.library.yale.edu. Retrieved 2018-08-12. ^ "Samarra Shrine Restoration in Iraq | United Nations Educational, Scientific and Cultural Organization". www.unesco.org. Retrieved 2018-08-13. On Wednesday, 22 February 2006, unidentified assailants bombed the Al-Askari Mosque in Samarra, one of the holiest Shia'a sites in Iraq, containing the shrines of Ali Al-Hadi and Hassan Al-Askari, two of the most important Shia'a Imams, and the mausoleum of Mohammad Al Mehdi, known as the "hidden Imam", and hosting millions of pilgrims annually. ^ "Iraq Significant Site 011 - Baghdad - Al-Kadhimayn Mosque and Shrine". www.cemml.colostate.edu. Retrieved 2018-08-13. ^ "Afghanistan Significant Site 147. Mazar-i Sharif". www.cemml.colostate.edu. Retrieved 2018-08-12. ^ "Sacred Sites: Mashhad, Iran". sacredsites.com. Archived from the original on 2010-11-27. Retrieved 2006-03-13. ^ "Ayatollah Khomeini's mausoleum: A symbol of Iranian pride". USA TODAY. Retrieved 2018-08-12. ^ "What is the mausoleum of Ayatollah Khomeini?". The Indian Express. 2017-06-07. Retrieved 2018-08-12. ^ "Iranians mourn Khomeini's widow". BBC News. 2009-03-22. Archived from the original on 12 August 2018. Retrieved 2018-08-12. ^ Annemarie Schimmel (1975). Mystical Dimensions of Islam. Univ of North Carolina Press. p. 238. ISBN 978-0-8078-1271-6. ^ "Timbuktu mausoleums in Mali rebuilt after destruction". BBC News. 2015-07-19. ^ "United Nations News Centre". UN News Service Section. 20 July 2015. ^ "Masons rebuild Timbuktu tombs after militant destruction – World – The Star Online". thestar.com.my. ^ Jafri, S.Z.H. and Reifeld, H., 2006. The Islamic path: sufism, society, and politics in India. Rainbow Publishers. ^ Jafri, S.Z.H. ; Reifeld, Helmut (2006). The Islamic Path: Sufism, Society, and Politics in India. New Delhi: Rainbow Publishers. ISBN 978-8186962855. OCLC 70335822. ^ Bahá'í World Centre (2007). "Shrine of the Báb". Bahá'í World Centre. Retrieved 2009-02-03. ^ Bahá'í World Centre (2007). "Shrine of Bahá'u'lláh". Bahá'í World Centre. Retrieved 2009-02-03. ^ Bahá'í Community of Canada (2014). "Bahá'í Shrine in Canada". Bahá'í Community of Canada. Retrieved 2014-12-06. ^ Huyler, Stephen P. (Author); Moore, Thomas (Forward (1999). Meeting god : elements of Hindu devotion. New Haven ,USA: Yale Univ. Press. pp. 42, 71–72, 89. ISBN 9780300079838. ^ Pintchman, Tracy (2007). Women's lives, women's rituals in the Hindu tradition. New York: Oxford University Press. p. 96. ISBN 9780195177060. ^ "Will Rogers Shrine of the Sun". Artsopolis Network. Archived from the original on January 1, 2012. Retrieved December 30, 2011. Wikimedia Commons has media related to Shrines. Shrines of British Saints by J. Charles Wall. Full Text + Illustrations.